We put our hands through quite a lot and they end up looking older than they should. 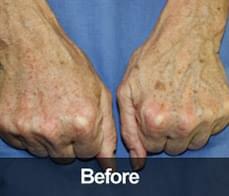 Hands are one of the first places where the tell-tale signs of ageing become apparent. Natural ageing, and exposure to sunlight causes the appearance of ageing. The more common visible signs of ageing include dark and spots age spots and pre-cancerous growth is a lots of fatty tissue also occurs making our hands look bony. There are a number of effective non-surgical techniques to rejuvenate your hands, improving the quality and texture of your skin, decreasing the wrinkling and prominent veins, restoring your hands to a more youthful appearance. I had such a quick response to my enquiry, the staff were very helpful and I had a date booked for me within minutes. I had a consultation with Dr. Salman who was very pleasant and talked me through the whole procedure in detail. I can't tell you how pleased I am with the results and I would definitely recommend this clinic to others! I would recommend this to a friend. It was good value and the procedure was completed to great satisfaction. 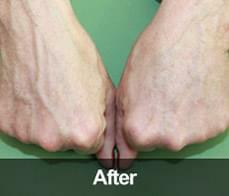 In order to restore youth and vitality to hard working hands – we can use a combination of treatments. We may consider the use of laser to remove dark spots and pigmentation, and the use of fillers to help combat indications of bony or veiny hands. Hand rejuvenation can start from as little as €250, but when you meet with your doctor he can review your concerns and come up with a solution that is tailored to your own personal needs. Patient care has always been at the forefront of everything we do. We believe that ‘aftercare’ is just as important a part of the entire cosmetic treatment procedure as the treatment itself. With Auralia, you can be rest assured that all your aftercare needs will be completely fulfilled, providing you the support you need for a fast and stress-free recovery. Our registered, professional and highly trained medical team are accessible at all times to advise you on your individual needs, to explain exactly what the procedure entails and to assist you with any concerns you may have following your treatment.